Taipei, Taiwan, May 25th, 2009 – Leadtek Research Inc., one of the world’s leading makers of multimedia products, today launched the English version of its latest and the most-compact-ever high performance transcoding card – the WinFast® PxVC1100. Wholly developed by Leaktek, WinFast® PxVC1100 represents a brand-new generation of MPEG4-AVC/H.264 transcoding cards with a Toshiba high-performance stream processor SpursEngine. The latter integrates four Synergistic Processing Element (SPE) cores based on the „Cell Broadband EngineTM” intelligence power protection, a one-slot adaptive cooling FAN sink and PCI-Express Low profile form factor. Leadtek is the EXCLUSIVE card-maker partner of the Toshiba SpursEngine business and keeps to work together with other software partners in building a number of exciting applications. Bundled with TMPGEnc 4.0 XPress, Multi-Format Video Encoding Software. 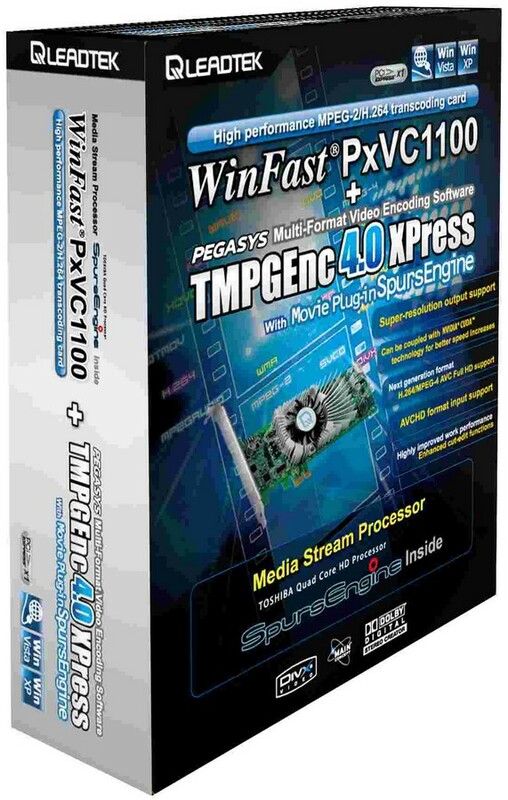 The ultimate combination of PxVC1100 and TMPGEnc 4.0 XPress (with TMPGEnc Movie Plug-in SpursEngine ) allows users to take control of the encoder circuits in the SpursEngine to experience incredible output processing speeds even when the CPU demands tasks such as high-definition video processing. And everything the SpursEngine cannot do is performed by TMPGEnc 4.0 XPress. These tasks include audio encoding or video and audio multiplexing. Users with an NVIDIA CUDA graphics card can see a total speed increase of up to 588%. See product webpage for benchmark details. Intent on making a similar market impact in Taiwan, Leadtek is offering both the advanced Software Development Kit (SDK) and two eye catching sales packages that should meet the demands of a wide cross section of customers. The SDK enables users to create their own customized software with lots of useful bundled programs. The pack includes WinFast® PxVC1100, Pegasys TMPGEnc 4.0 XPress with Movie Plug-in SpursEngine software, a low profile bracket and a power cable. If you’re ready for the wonderful world of HD then now’s the time to join thousands of users who are already following the heart throbbing trend of Leadtek’s WinFast® PxVC1100.